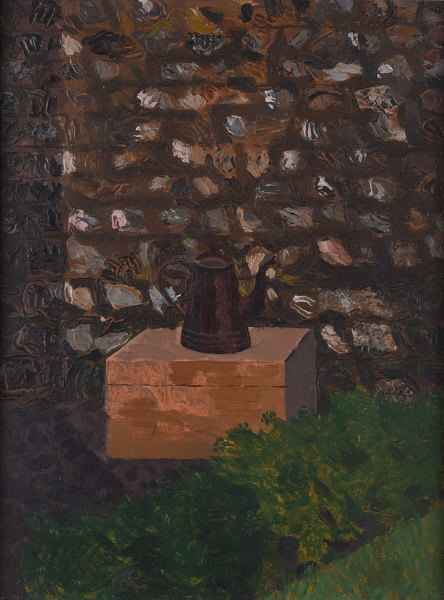 Exhibited: Towner Art Gallery, Peggy Angus & Friends, 1987 (ex cat) lent by Kenneth Rowntree. "I first met Kenneth at the 'volunteer' pub: at the Baker Street end of Regents Park in 1938 - I had walked across the park with Eric Ravilious who was staying with me and my husband Jim Richards (now Sir James) in Primrose Hill. It was a lovely sunny day - Life seemed good. Kenneth was a nice broad blonde boy. He had been a student of Eric's at the Ruskin School, Oxford, during the short period Eric taught there before the war. Eric, quite rightly, thought his work full of promise. During the War, Kenneth, from a Quaker family, was exempt from fighting, but he painted a number of pictures for the war artists - one of embattled Primrose Hill, and he decorated Canteens and other newly sprung places. He and Diana left Adelaide Road, to sample the new box-like Isokon flats designed in Hampstead by Wells coates for Jack Pritchard. At an early exhibition of Kenneth's at the Leicester Galleries I fell for a delightful painting of his of a Saddler's Shop in Clare. I hadn't the money for it, but cajoled the gallery into accepting a banker's order for £2 a month. The painting gives me great joy. I think it is the best he ever did. I was horrified at the influence Newcastle had on him. There he succumbed, like Victor Pasmore before him, to abstraction. Thank goodness, he seems to have worked through that chapter." Peggy Angus. Source; Kenneth Rowntree, exhibition catalogue 1980. In 1934 Eric Ravilious was invited by the artist Peggy Angus to stay at her home, Furlongs on the South Downs. 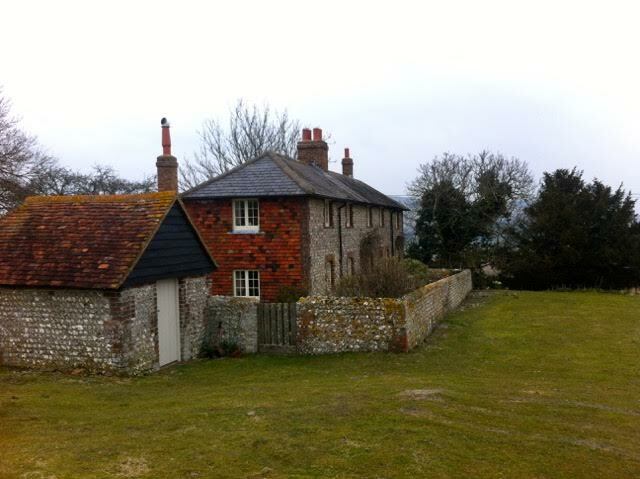 Furlongs was a flint-faced shepherd’s cottage below Beddingham Hill on the Firle Estate. 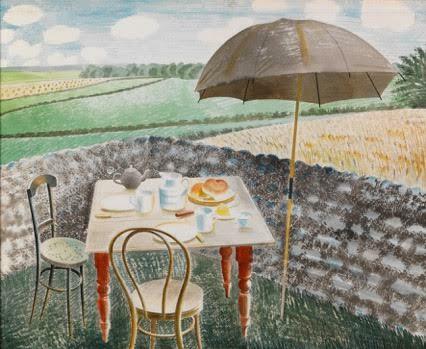 Ravilious was captivated by the local landscape and over the next five years he and his wife Tirzah visited many times. They even bought two ‘caravans’, originally Boer War fever wagons, which they moved to Furlongs as extra accommodation for their many artist friends who came to stay. 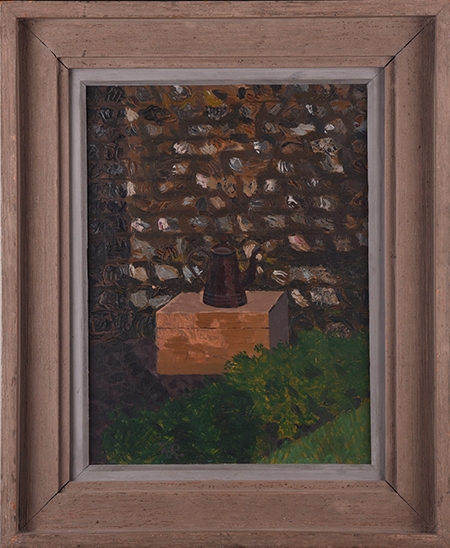 Peggy Angus and Kenneth and Diana Rowntree would have become acquainted when the Rowntrees moved to Great Bardfield 1941, though Peggy Angus clearly admired Rowntree's pictures prior to that buying one of Kenneth’s paintings from the Leicester Galleries around 1933. Kenneth and Peggy were both working for YRM after the war; and it was Kenneth who saw Peggy’s tile designs and suggested printing them out as wallpaper and his was one of the first commissions – for their new Chiswick house.